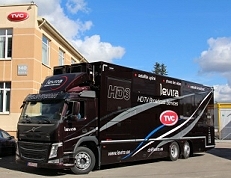 Levira has new HD OB production truck for use in Estonia, Helsinki and the Baltics. Tallinn, Estonia, November 2016: This is Levira’s third OB truck, designed mainly for medium and large productions but also suitable for low-budget projects thanks to its flexible cost-effectiveness and configuration. The truck equipped with Ross Carbonite Black HDTV Vision mixer, Lawo Mc2 56 Mark II audio console, 5.1 Dolby Digital audio system, Imagine Platinum routing system, fully digital Riedel intercom and VSM Virtual Studio Manager for configurations. This cost efficient, modern and ergonomic vehicle will help us fulfil the growing needs and expectations of Levira clients, especially in Scandinavia. The truck is easily manoeuvrable and can be used in places with limited access, such as the narrow streets of Tallinn and Riga Old Towns. The first planned large productions with the new truck will be the broadcasts of KHL matches in Riga, Luge World Cup in Sigulda and EuroBasket group stage in Helsinki. In January 2018 Estonia will Estonia will assume the presidency of the European Union. During that time there will be a lot of very complex and demanding live broadcast productions and Levira will be fully prepared for that as well. Levira is one of the largest TV play-out service providers in Northern Europe and the largest Outside Broadcast service provider in the Baltics. Levira has three HD OB trucks and UAV (drone) for live TV production. Levira’s customers include multinational and regional IT companies and broadcasters like Turner, Sony, MTG, EBU, ERR, Discovery, ATEA, A-Data, TeliaSonera, Tele2, Elisa, Starman, TV3.